We appreciate the time you have taken to investigate this offer. As you know an in-house MRI could benefit your practice by expanding your diagnostic capabilities and improving how you care for your patients and their families. Now you need to determine if this rental plan is the best method for bringing this technology to your practice. Please use the quick form below to determine the potential for MRI in your practice. The Details tab above will give you more information on the UMS rental program and if it is a good fit for your bottom line. Veterinary fees for MRI across the US vary from $1200-2500 per scan. Why choose UMS for your MRI? MRI is making its mark in veterinary medicine. Clinically, it has been shown to reduce the invasiveness of surgery as well as the time of the surgical procedure. It can often give your clients the answers they need to make decisions concerning their family members. Offering MRI as a diagnostic tool will set your clinic apart from the rest. UMS has set itself apart from the rest by offering the only dedicated veterinary MRI scanner on the market. What are the details of the rental program? 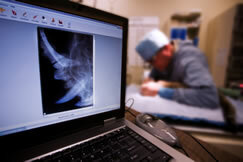 Universal Medical Systems has been a market leader in veterinary imaging technology. UMS would like to expand its network to include clinics looking to move into the 21st century by offering their clients the best diagnostic care available. We have the proven expertise with hundreds of installations to manage the technical details. A newly designed rental agreement helps to introduce the technology to your staff. UMS will rent you one of our dedicated Vet MR systems including the installation of the scanner, train your staff on-site, maintain, repair and upgrade the system. Your responsibilities include: a $25,000 non-refundable down payment; site preparation including electrical, HVAC or other construction considerations; equipment needed for monitoring and general care of the patients; and a $495 fee paid to UMS for every MRI scan done on a patient. What about the image quality on the MRI? Many scientists, engineers and veterinarians have spent untold hours developing the scanner, hardware, software, coils and sequences for this dedicated veterinary MR unit. Years of development have been invested to provide the best possible images. With our expert world-wide team we strive to provide outstanding service for installation, training and maintenance, so every clinician will have the best images possible at hand to use in the diagnosis and treatment of their patients. Can I really get out of this rental at any time? Yes! UMS wants to partner with veterinarians to promote the use of MRI in veterinary medicine. If the outcome is not beneficial to all parties there are provisions in the formal contract specific to dissolution of the rental agreement. Please refer to the formal contract for specific details. What are the specifics of this rental program? Why are UMS images better? © Copyright Universal Medical Systems. All Rights Reserved.